The Cardoon plant, scientific name Cyanara cardunculus, is a tender perennial plant that looks like a cross between celery and burdock. 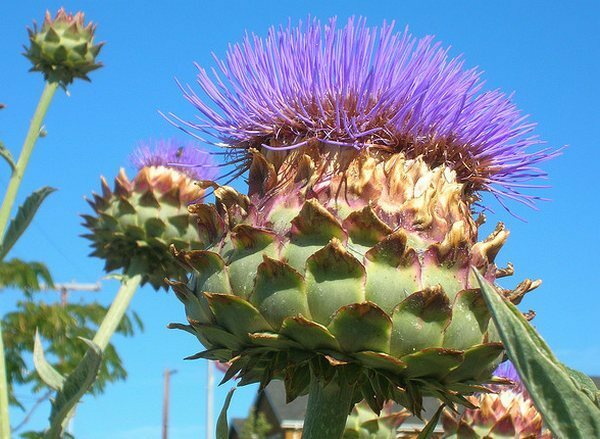 Common names for Cardoon include the Artichoke thistle, Cardone, and Cardi. It has silvery leaves that form a distinctive, upright sculpture-like shape. Cardoons have heavy, fuzzy gray-green leaves that are deeply cut and a heavy bristled flower head. It can grow up to four feet (120 cm) tall and two feet (60 cm) wide, making it difficult to grow in small gardens. Cardoon Cynara cardunculus photograph by Brewbooks. Cardoons are normally perennial in USDA zones 7b to 10, and are grown as an annual in climates above that. It is grown for its fresh leaf stalks; these are blanched and are then normally eaten like celery. The large celery looking stalks of cardoon can be served braised or steamed. The plant is a member of the artichoke family and its taste and texture mostly resembles artichokes. The plant is usually available in the market during winter months only; in the United States, cardoons can be found in some specialist stores but are mostly found at farmer’s markets. Cardoons at the market by Phil Whitehouse. In addition to the use of the Cardoon stalk, many diners and fine restaurants boil the main root and serve it cold as it produces a sensual and stimulating flavor. Cardoons have many different variants; these include the Large Smooth ones, Ivory White Smooth, and the Large Smooth Spanish. Every variety can be grown in any location, depending on the area’s temperature. Cardoons are best grown in full sun, though it can also tolerate partial shade. Choose a location for growing cardoons that has a well-drained soil and is rich in organic matter. It is advisable to prepare the beds used for growing Cardoons two to three weeks in advance with aged compost or decayed manure. Cardoon prefers a soil with an almost neutral pH of 6.0 to 7.0. The plant needs to be sheltered from strong winds as these may tear and destroy leaves. The cardoon plant is best grown from a transplant that is set in the garden three to four weeks after the average last frost date in spring. Cardoon seeds should be sown indoors about six weeks prior to transplanting. 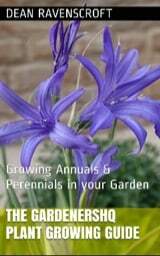 For indoor sowing first fill a container (a platted box or pot) with enriched potting soil. Sow the cardoon seeds at least one inch (2.5 cm) deep and water to settle the soil. The container should be placed in a sunny window in order for it to receive an adequate amount of sunlight for growth and development. Water the seeds regularly but never allow the soil to become soggy as this can cause the seeds to wilt. The plant germinates best at 75 degrees Fahrenheit (24°C) and is ready for harvest approximately 120 days after transplanting. The plant is expected to start sprouting in 6 to 12 days time, and is ready for transplant two to three weeks after germination. Preferably transplant cardoons during mid-spring, well after the last frost. Dig a hole that is at least an inch wider than the container that the seedling is growing in, carefully remove the plant and place in the hole. Fill the hole with soil and slowly tramp down so that any air bubbles are removed. Supply some water in order to settle the soil. Some of the finest companion plants for cardoons are perennial vegetables that include asparagus, but avoid planting with vines or root vegetables. Cardoons should be watered evenly, but always make sure that the plant dries out between watering. This will help to prevent the plant from drowning. Fertilizers such as aged compost should be added to the planting beds prior to planting and again during mid-season. Cardoons are mostly attacked by pests such as aphids. Spray aphids off the plants with a blast of water and pinch out infested foliage. Cardoons do not have many serious problems in their ability to grow; indeed they may become invasive in many areas. Therefore it is important not to let the plants set seed. The plant is normally blanched in order to make it more tender and improve its flavor. Therefore, when Cardoon plants are around three feet (90 cm) tall, about three to four weeks before harvest, hill up soil around the stems and tie the leaves in a bunch and wrap burlap or paper around the stems to around 18 inches (45 cm) high. Four to six weeks after blanching, cardoons are ready for harvest. Cut the stalks off at ground level and carefully trim the leaves away. The stalks should be kept in the refrigerator for about a week or two and should be wrapped in plastic or paper. Cardoon can be canned, dried or frozen; treat it similarly to Celery.